Clinical Negligence Claims – Mediate! NHSLA set up a mediation panel to deal with claims using mediation on 5 December 2016, we launched a new claims mediation service following competitive public tender. Contracts were awarded for an initial period of two years. It is probably too early to say but we have seen no evidence of the organisations appointed doing anything significant to increase the take-up of mediation in clinical negligence claims. This may be because clinical negligence lawyers are resistant to using mediation and consider that they are better off holding joint settlement meetings. We would respectfully disagree-JSMs are missing the important component of an independent mediator who can help negotiate between the parties and facilitate a settlement. For NHSR, there is nothing to be lost by offering mediation on every case as a refusal to mediate by Claimant solicitors could result in them not recovering their costs at trial. If Claimants are concerned about using NHSR’s own panel of mediators, their cost and impartiality, they can always put forward their own choice of mediator and NHSR should not refuse to use them. ProMediate has a panel of perfectly competent mediators who can mediate in clinical negligence cases. So far it is too early to say whether the mediation service has had any impact on resolving claims more cheaply, quickly and saving costs as the report relates to 2016/17 and the scheme was only launched in December 2016. That said, the report illustrates why early resolution of claims with the assistance of a mediator is sorely needed. 31.5% of cases were litigated although only .07 of cases actually went to trial. 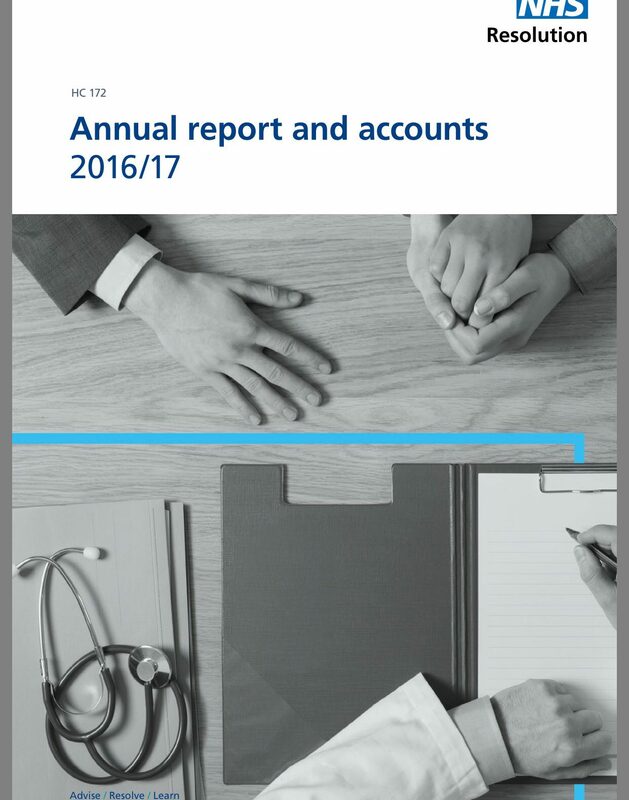 While the number of clinical negligence claims brought against the NHS in 2016/17 fell 2.5% year-on-year, claimant legal costs rose 19% from £418m to £498.5m. Defence costs increased by 5% to £125.7m, according to the annual report. NHSR, which replaced the NHS Litigation Authority in April, received 10,686 claims in the year, down from 10,965 the previous year. Claims numbers are now down 10% over the past three years. However the overall costs of clinical negligence payments continued to rise, by 15% to £1.7bn in 2016/17. The increase, at a time when claim numbers fell, was explained by payments on claims from previous years. Damages paid to claimants tipped over the £1bn mark in 2016/17, rising from £950.4m to £1.083bn. 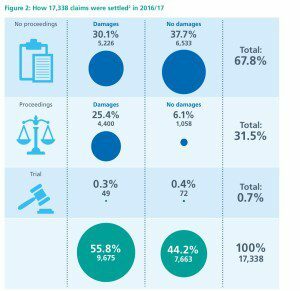 Damages made up 64% of the overall cost of claims, the same figure as in 2015/16. The increasing costs involved in handling clinical negligence claims will fuel calls for curbs on the costs available to lawyers, with the government currently considering a fixed costs regime. Helen Vernon, NHS Resolution chief executive, said the figures illustrated the ongoing challenge of ‘disproportionate’ claimant legal costs. The report does, however, note that the percentage of claimant costs in relation to damages, for claims worth less than £100,000, fell during the year. 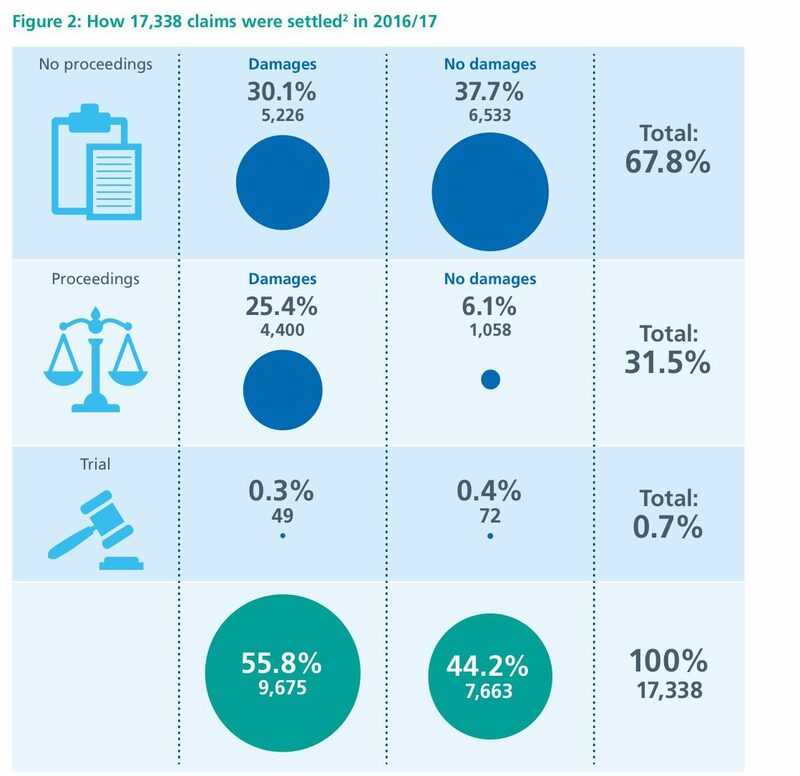 The average claimant legal costs for these cases were 53.45% of the damages received, down from 54.83% in 2015/16. The percentage had previously risen every year since 2004. We hope that the introduction of the mediation service will result in better figures next year, but that remains to be seen if the resistance to mediation amongst practitioners continues.